The idiom "can of worms" refers to doing something that creates a litany of other problems and creates more trouble and complicates the situation or problem trying to be solved. 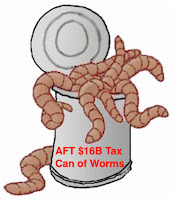 The All for Transportation (AFT) 30 year $16 Billion sales tax hike is now looking like a can of worms. AFT ignored transit reality and the reality is happening now. Costly proposed rail projects across the country continue to be ditched as transit ridership continues to decline nationwide. The Durham light rail has died. Las Vegas has ditched a proposed billion dollar light rail. A San Jose existing light rail line is being shut down. Phoenix city council recently voted to divert funding for another light rail project to road projects. A citizen initiative to halt expansion of Phoenix light rail system will be on the ballot in a special election in August. In addition, the US DOT cancelled almost a billion dollars of federal grant monies yet to be paid for California's HSR boondoggle. Governor Newsom abandoned the CA HSR project as designed. And Ontario Canada recently halted a proposed HSR in southwestern Ontario. Recently a transit study was done by our local transportation experts at the USF Center for Urban Transportation Research (CUTR) for FDOT. The study reveals the reality of pubic transit today versus myths propagated by transit advocates. Florida has seen dramatic ridership declines in the past four years. These declines are over two times more severe than those for the nation on average, and have continued well into 2018. 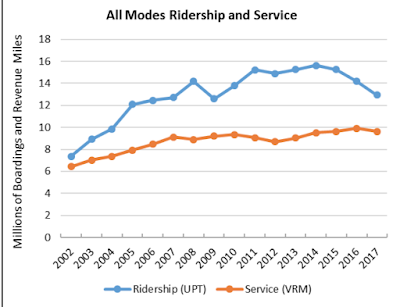 The declines are relatively pervasive with no areas escaping the pressures on transit ridership. Of concern, the most severe declines have been in those locations, like southeastern Florida, that are the most conducive to transit. The magnitude of the declines exceeds those observed in prior economic cycles and have been traced to a set of conditions, some of which have not been witnessed previously. The conditions that have contributed to changes in travel behavior have not necessarily fully played themselves out. However, in light of having new options, more trips made by the growing population are opting for alternatives to transit. Transit is losing in the competition for attracting customers. Some travelers are replacing travel with communication, for example working at home and shopping via e-commerce. Many others have added household vehicles offering an alternative for individuals who were previously inclined to use public transportation. Still others are using transportation network companies as an alternative to transit for some trips. Florida faces a dilemma, growth is still robust and decision makers aspire for the growth that provides employment and economic opportunities. There is often an unwillingness or inability to meet mobility needs by expanding roadway capacity despite demand, but the hoped-for public embrace of public transit is not materializing. 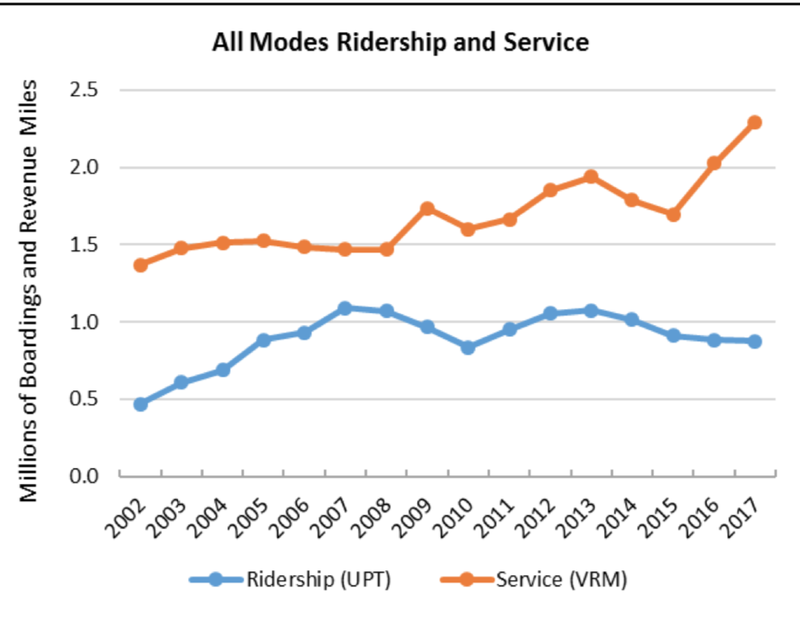 Individuals’ travel decisions are not growing transit ridership. The challenge facing transportation planning and operations is profound. ….as more options have become available to travelers and activity patterns continue to disperse as metropolitan areas in Florida grow, we may see increasing areas where markets may not justify fixed route services. The study states that acknowledging the big issues and problems related to traditional transit is first and foremost. We must acknowledge that "spending resources (taxpayer dollars) without commensurate levels of utilization do not accomplish the goals of public transportation". The study asks to identify opportunities that may substitute for traditional transit more cost effectively and responsively to customer needs. And of course the study encourages we watch the "emergence of automated transportation services carefully so the industry can position itself to both embrace automation where appropriate and relinquish the role of traditional big vehicle fixed route public transportation services if mobility-as-a- service options render them uncompetitive in some markets." 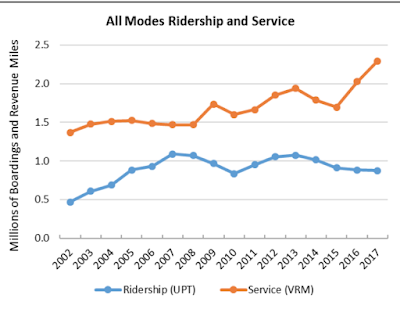 Appendix A starting on page 121 of the study provides data for each transit agency in Florida that reflects the continuing decline of transit ridership. 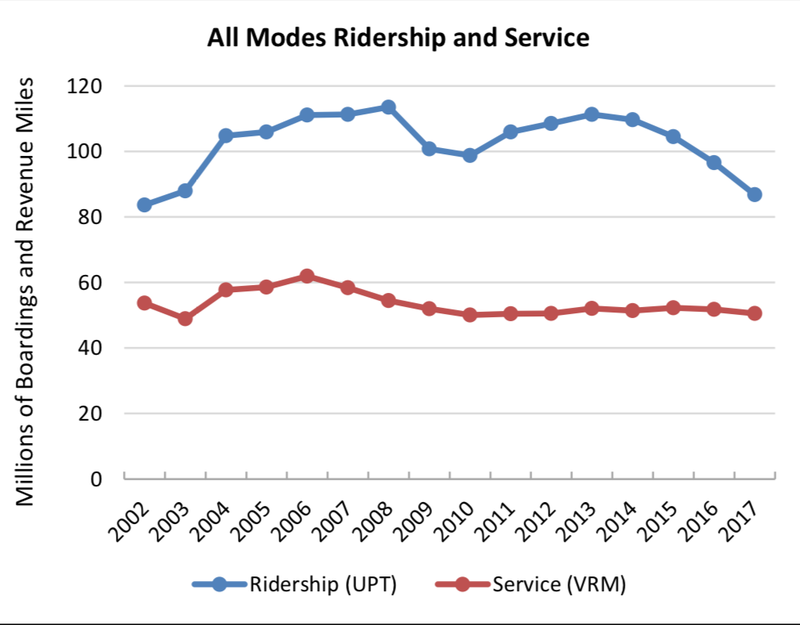 Some transit agencies increased their services as ridership continued declining decreasing their service productivity. That reduced productivity results in less fare box recovery and taxpayers subsidizing a greater percentage of the operating costs of the services. 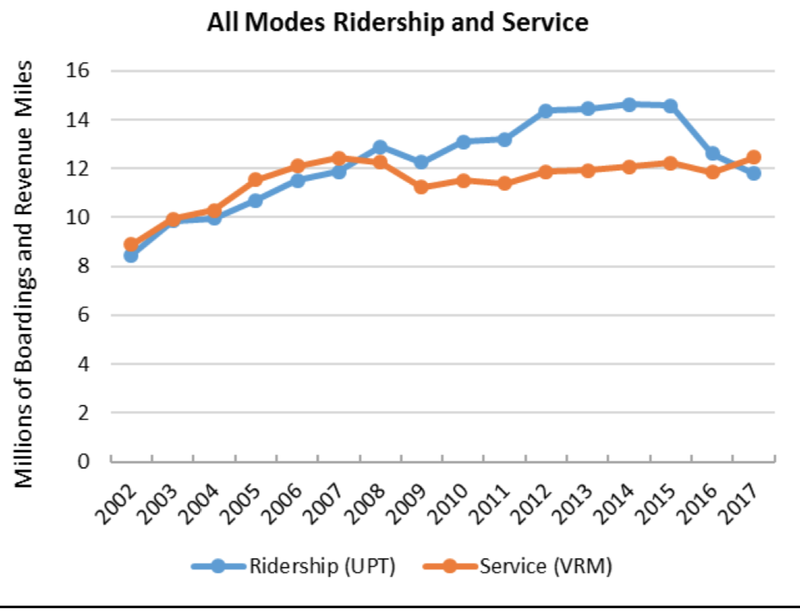 Ridership on Miami-Dade transit has declined 22% since its peak in 2013 while service miles remained stable. The study states "the downward ridership trend in Miami Dade County is among the most severe in the state and country." Transit ridership in South Florida, the most densely populated part of the Florida, has tanked since 2013/2014. Since that time South Florida has been improving and expanding their highways and interstates and commuters are rejecting transit. 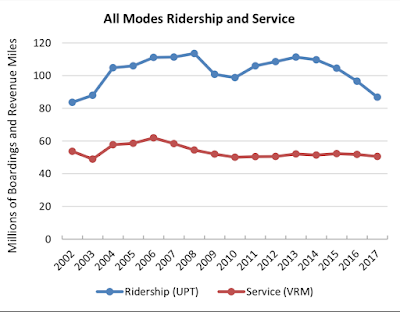 Ridership on HART in Hillsborough County (page 135) declined 17% since its peak in 2014 as service miles increased 1%. Ridership declined as the county's population grew. 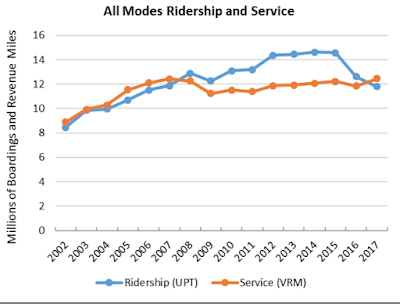 Ridership on the financially struggling PSTA in Pinellas County (page143) has declined 19% since its peak in 2014 as PSTA increased their service miles by 3%. Ridership on the Pasco transit system has declined 19% since its peak in 2013 even as service miles increased 18% while growth in Pasco has boomed. The CUTR study confirms why costly rail projects are being ditched all over the county. It confirms how risky it is to force taxpayers to spend millions and billions more on traditional transit, especially costly rail and fixed guideways. This study is devastating to the All for Transportation (AFT) 30 year $16 Billion tax hike and the taxpayers of Hillsborough County. The AFT charter amendment tax mandates and forces Hillsborough County taxpayers to spend $7-8 billion more on transit that only 2% use today. To my knowledge…no transit project or service has ever been the clear direct cause of a substantial drop in traffic congestion. So claiming that a project you favor will reduce congestion is unwise; the data just don’t support that claim. 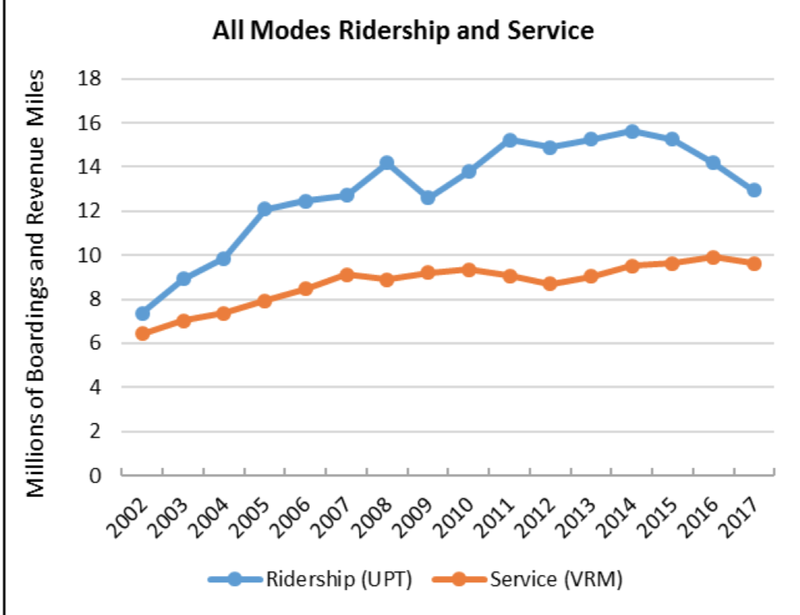 Costly transit services are dying and appear to be on the way to becoming irrelevant. Traditional transit is being disrupted. Transportation is becoming more decentralized similar to what Internet commerce and Amazon has done to traditional retail. 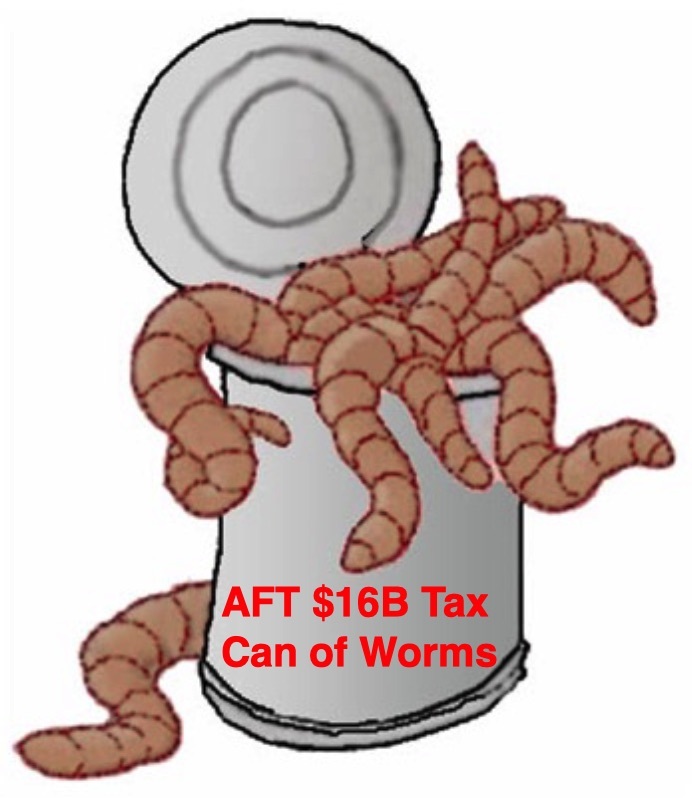 But AFT provides no ability in their tax hike charter amendment (other than going thru another charter amendment) to redirect or repurpose any of their transit billions to anything else. AFT specifically restricted the $7-8 Billion to transit and fixed guideways for 30 years. Elected officials in other counties in Florida and throughout the country will have the ability and agility to embrace more cost-effective 21st century transportation solutions. Those counties will become more competitive as Hillsborough gets stuck for decades (or forever) paying for costly and outdated trains and fixed guideways. This study reveals the AFT advocates, Jeff Vinik and his wealthy special interests allies who funded the AFT tax hike, are not transit or transportation experts. But their short-sightedness is costly and AFT's mandate that billions must be spent on dying transit services will cause havoc as congestion increases in Hillsborough County. We posted here on October 10th last year the AFT tax hike is a bailout for dying transit and will be a costly transit failure. As issues related to the AFT tax hike continue to increase not diminish before one dollar of AFT tax has been spent, AFT already looks like a failure. The CUTR study simply confirms the AFT $16 Billion tax hike is a transit tax boondoggle. And All for Transportation deceptively sold a costly can of worms to Hillsborough County voters/taxpayers. Sharon, Have your readers also examine TCRP's reaserch report 201, "Understanding Changes in Demographics, Preferences and Markets for Public Transit", Coogan, M. 2018. The future Millennial age group participation in public transit goes down with age. Seems after 30 they want to move to the burgs. These two articles show that transit organizations, electeds, bureaucrats and tax payers must have a serious conversation based on the facts as how to best proceed. Key word is facts!